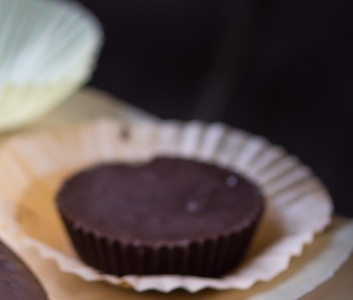 Cold and chocolaty on the outside, creamy and decadent on the inside—this slimmer spin on peanut butter cups satisfies your sweet cravings for less than 100 calories. In a small bowl, mix the banana and vanilla. Mash it together well and set aside. Place 6 liners in a muffin tin and spray liberally with oil spray. Silicone muffin liners work best as it’s easier to remove the chocolate when it’s time to eat. Set aside and prepare chocolate. In a saucepan, melt the chocolate and milk on medium heat, stirring constantly. Once you get a smooth chocolate, add a generous tablespoon to the bottom of each muffin liner. Once you have placed chocolate at the bottom on each cup, stick it in the freezer to firm up (about 10 minutes). Once the chocolate is firm, distribute the banana filling evenly onto each cup and spread out evenly with fingers. Split remaining chocolate among each, using your fingers to spread each layer evenly. Place tin back in the freezer for at least 4 hours (overnight works best). Pop each “cup” out of the liners and serve immediately!